Summer in northern Michigan, that balmy, all-too-brief, barefoot season, inspires me to pick up my camera more often than any other season. On these sparkling days, I find endless beauty in the Traverse City region. Since I am, at heart, a shoreline sunset shooter, I tend to look for evening vantage points. 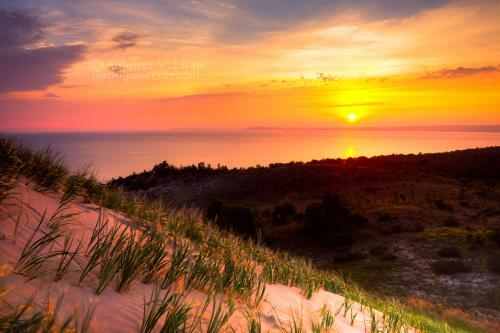 When the light is promising, I am drawn to the big lake, especially the beaches and overlooks of Sleeping Bear Dunes National Lakeshore. The Empire Bluff Overlook Trail offers spectacular scenery in every direction, in any weather. Clear days allow for expansive views, while foggy days add an element of mystery. 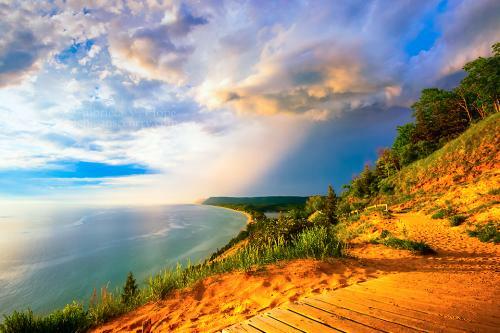 But the most exciting conditions for photography happen when summer storms move across Lake Michigan, transforming the colors of water, sand, and sky. The trick is to shoot while the storm (and potentially dangerous lightning) is still miles away over the lake. On this particular evening, sunny skies with cotton-candy clouds greeted me as I parked at the trailhead. Twenty minutes later, when I arrived at the overlook, beautiful storm light glowed upon the scene, filtered by dramatic thunderheads. 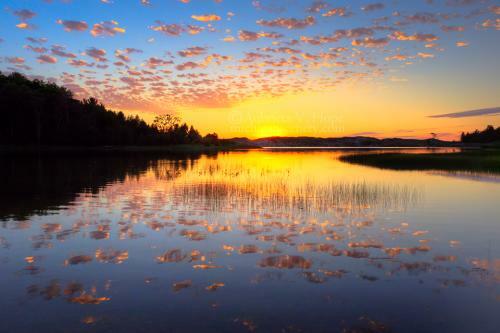 At Sleeping Bear Dunes, locations for gorgeous shoreline photos abound, but North Bar Lake is possibly the most versatile, especially at sunset. This clear, deep lake runs north-south, spilling into Lake Michigan to the west. On calm evenings, I like to photograph sunset reflections on North Bar, with the sun winking over the dunes as it sinks into Lake Michigan. When the weather is blustery, I take a short hike over the dunes and shoot crashing waves on the Lake Michigan shore. My favorite destination at Sleeping Bear Dunes is Pyramid Point. I love it so much that I&apos;m even willing to get up early and hike before dawn to get a sunrise shot. Perched at the northern edge of the Port Oneida Rural Historic District, this trail provides a wilderness experience, with panoramic views of the Manitou Passage. Aubrieta V. Hope is a landscape photographer and writer with a special interest in northern Michigan. 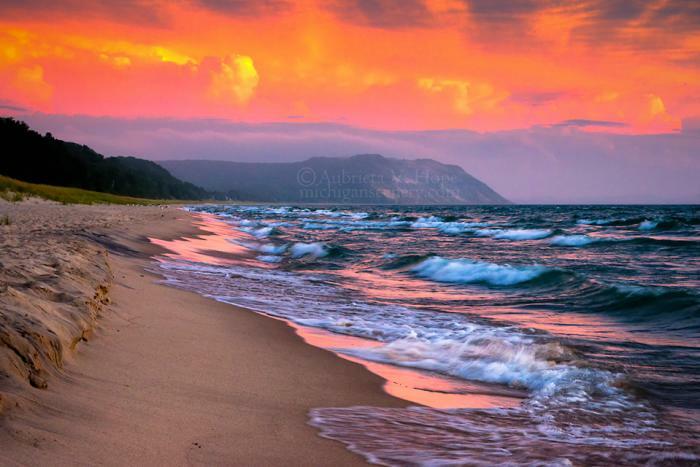 To see more of her work, visit michiganscenery.com, check out her Michigan Scenery Facebook page, or view her Instagram gallery @aubrietahope.